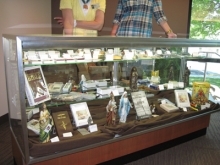 A display case with religious items for sale is located in the church narthex. Articles are sold before the Saturday 4pm and Sunday 9:30am-11:30am Masses or by appointment. We also will personal shop for special occasions. For more information, to set an appointment or for personal shopping, call Mary Edith Burns at 816.942.2702 or 816.898.5162.